Etosha is a strange place before the rains. Some animals, like the springbok and gemsbok, can do without water but other like elephants, rhinoceroses and zebra must have water almost every day. This means that the few waterholes around the park are flooded with animals coming in for a drink round the clock. For watching wildlife, there is no better time but there’s no worse time to be wildlife. The clouds build up in the weeks before the arrival of the first storms — which are violent, strong and have dangerous looking lighting strikes. 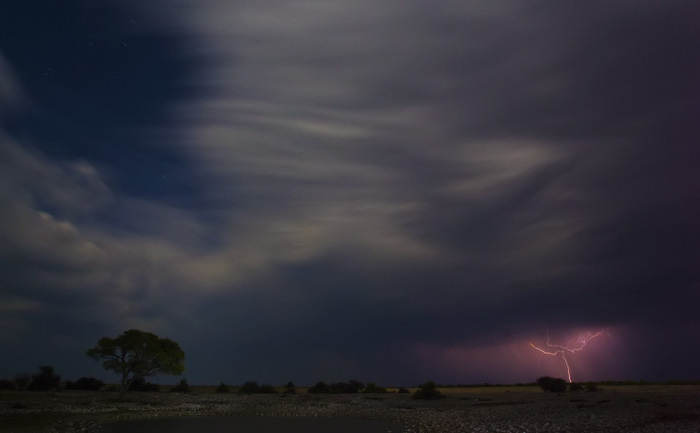 The flat country allows a person to see storms many tens, or hundreds, of kilometers away, but it’s the clouds that tease animals and people alike just before the fury of the first rain.